Moi Meme was designed as an adjunct to my research for my Honors presentation. My research entailed searching out paintings, or other works of art, that depicted women– and a few men–in the act of stitching. I interpreted “stitching” very broadly–the subject could be sewing, or doing embroidery, or knitting, crocheting, making lace, or even very broadly–making nets. The research was very gratifying and fruitful, and by the time that I made my Honors presentations I had identified close to 300 images of people engaged in some form of the needlearts. At this writing, some eight years later, that number is now greater than 800. Moi Meme is more or less a self portrait. 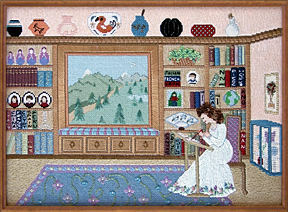 The stitcher– a much younger and slimmer Gail Sirna, is seated at her frame, in her studio, and she is busy with her embroidery– much the same as many of the artists’s subjects were. Behind my little stitched image is an array of bookshelves, and the books and other objects are items that are significant in my life. On the left, in the oval frames, are pictures of my three children. Below them are books that contain the titles of places that I have visited: Italy, China, France. Egypt, Spain, Peru. An Eiffel Tower model fills in the rest of the space, for France is my favorite place. The bottom shelf holds numerous art books; these reflect the reality in my house, but also allude to my Honors study. The topmost shelf contains a set of matryoshka dolls– which really exist in my studio, and are a reminder of my visit to Russia. In the right hand bank of shelves one can see a portrait of my little grandson, and another of my husband pictured in Macchu Picchu. A stack of books indicate the languages I have studied: French and Italian resting on top of a strong basis of Latin. Other books depict organizations to which I belong: NAN, EGA, ANG. There are books that indicate types of needlework that I have studied: crewel, silk, needlepoint, lace. Others indicate my collection of of needlework publications. We are collectors of Native American pottery, and on the shelf above the window some of my larger pots are portrayed–these exist in my home, as well as in my embroidered piece. When one looks out the window in my stitched piece a mountain scene is revealed. This is not reality, but but in my dreams it would be like this. Or at least, that was my thought when I created this design. But when I restitched this piece my dream had changed, because no longer are there mountains, but now a tropical scene. But, please notice, in Moi-meme, in the mountain scene there is tiny plane, beckoning me to fly away to yet another exotic place. Moi-meme is a self portrait of sorts, and a very autobiographical piece of art.